Chad's eight years of CrossFit experience make him a valuable addition to Koda's coaching roster. As a coach, he exudes a calm confidence and focuses on correction of form. In both nutrition education and fitness, he helps his clients realize that they are more than what society says they should be. Not exactly your everyday CrossFitter, Chad Hamilton has gone through a long evolutionary process in the CrossFit world. 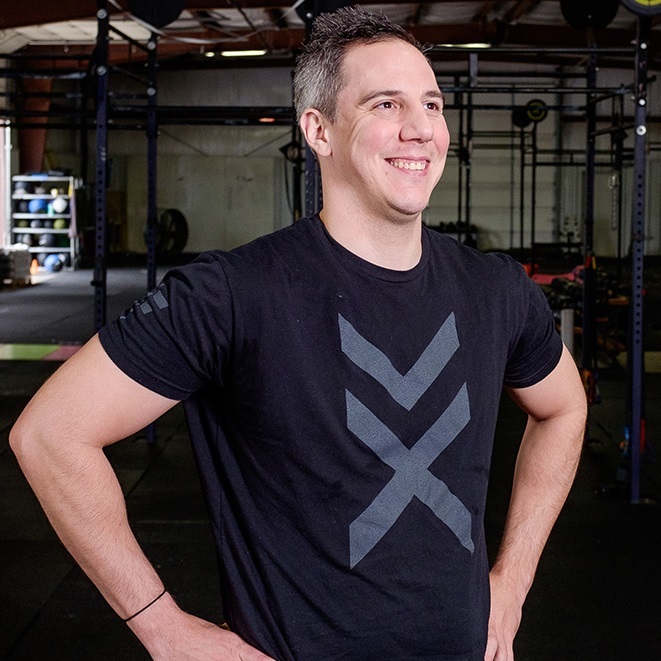 As a nine-year member of various affiliates across the US, Chad has found his way through the varieties of specializations and training styles that CrossFit has to offer. As a certified CrossFit Football trainer and self-acclaimed "Power Athlete," it is no wonder why Chad has such an affinity towards the Strength & Conditioning portion of CrossFit. Luckily for Koda, their members get to reap the rewards of this obsession. Drew Hymer, an Oklahoma City firefighter since 2008, found CrossFit while looking for a way to physically prepare for the Fire Academy. In 2009, he met Brice and Jared, who have remained his close friends and co-competitors ever since. An intimidating looking, tattooed beast of a man, Drew is a formidable competitor. Yet he can often be found with a toddler sitting on his shoulders, followed by a group of excited kids, because his enjoyment of CrossFit is contagious. Drew acknowledges that he would not have achieved his competitive success if training were not also fun. And while he takes his training and competitions seriously, he most enjoys coaching those who are new to CrossFit. "It takes guts to try something out of your comfort zone," he says. It's exciting to see CrossFit helping regular people become healthier. From recent college graduates to grandmothers trying something new, Drew works with all kinds of clients at Koda. "I like the mix of people and the peaceful atmosphere. I am blessed to have met so many great people and role models here that my son will grow up around." Drew credits Koda with bringing him a lot of happiness, which he hopes to share with his classes. He likes to give his students a place to center themselves, focus, and take a break from life's responsibilities and stresses in a healthy way. Drew and his wife live in Oklahoma City with their son Max and their boxer Beast. When he's not focused on squatting, Drew enjoys bacon, sports radio, Disney movies, Will Ferrell quotes, and dropping sick beats. Anthony (affectionately known around Koda as "A-Robb") used to be the guy that corporate gyms bank on: he would pay for a membership then only sporadically show up. Though he enjoyed some recreational basketball and had taken up running, he says it was with CrossFit that he finally found something that would keep him consistent in fitness. "Once I got into the lifts and movements I had never done before, I was hooked." He points to the constant variation, the ability to continually improve, and the overall fun as reasons why, after more than three years doing CrossFit, he has never felt bored or burned out with his workouts. Anthony began coaching in order to share his passion and help other people have the same great experiences that he has had. He likes to emphasize that CrossFit is for everyone. "I'm a normal person," he says, "which proves you don't have to be an elite athlete in order to participate." He adopts his clients' goals as his own and strives to be a positive influence both in and away from the gym. He loves seeing how CrossFit and the Koda family help people change their lives. Mai will forever be known as "Momma" at Koda CrossFit. Opening Koda with her husband, Jared Muse, in December of 2011 while their partner, Brice Collier, was overseas was very challenging but has proved to be very rewarding. With over 200 "kids" now, her duties at the gym have expanded as well. If you ever have a boo-boo, Mai will take care of you. Need someone to talk to, Mai is there to listen. Be careful though, you may find yourself in "time out" if you're on the wrong end of gym etiquette. Mai wears many hats at Koda and the gym would not be where it is and have the environment that it has without her there making sure things run smoothly. Regardless if you're a member, an out-of-towner or trying Koda out for the first time, you'll be greeted at the door by her and you can tell right away that there is a lot of love behind that smile of hers. "We started Koda with the idea that we would do our part to try and help the crossfit community grow. To have a gym that our members enjoy coming to, hanging out, working out, making friends and leave feeling better about themselves because they know they gave their all for 1 hour. I want our members to be happy and healthy. I want them to want to be at Koda and feel like it is a safe place for them to be themselves and to be able to work out the stresses of their day. I want them to feel appreciated and know that without them, there is no Koda." I have always been very competitive! I enjoy fitness, being active and playing games. I'm a huge child! I love practicing skills and the sense of accomplishment I feel when I master them. I love lifting heavy things and feeling strong. My first CrossFit class was in 2012. I was hooked from day one! It's so fun. There are so many variables, it's always something new! I started coaching at Koda in 2014 and I am grateful for every second. I look forward to the hours I get to spend at the gym and all the different people I get to be around. Helping them with their fitness goals and seeing their excitement when they achieve something makes me feel very happy. Another reason why I do crossfit is because it makes everyday life that much easier. Like, walking up my stairs, carrying all 15 sacks of groceries in a one time, or walking around the zoo all day! Lastly, I like to tell people it saved my life. Because it did. My appendix ruptured in 2015 and poisoned me for two days. My surgeon told me that because I came in so healthy, I probably lived a day longer than I should have. That's neat, to me. That my body is that tough. CrossFit prepares you for life. I love it so much!